My husband's birthday was earlier this month and my son wanted to make him a present using all of the bottle caps he's been collecting or months. After surveying my craft stash I decided to use the bottle caps to make a personalized picture frame. My little assistant helped me to wash, dry and sort the caps. To personalize the frame we decided to use a reverse stenciling technique to write "We love you Daddy XOXO" on some of the caps. To do this I used some small alphabet stickers I had on hand and applied them to the caps. We arranged the caps on our frame to make sure we liked the way to looked before proceeding. Since the caps are hollow, they cannot be glued to the frame (or anything else) with out filling them first. 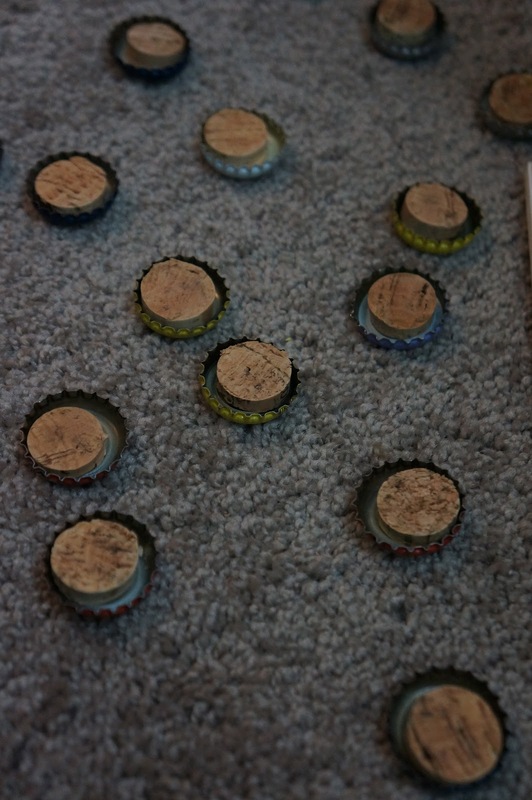 To do this I used another drinking related item we have been collecting - corks. I swear we are not alcoholics! The corks are the perfect circumference to fill the caps. I used a sharp knife to cut little cork disks to fill the caps. I used 10 corks for this project. My assistant helped me to put a cork in each cap. I followed behind him and secured each cork with hot glue. Once the corks were set, we took all of the caps we had placed letter stickers on outside and sprayed them with a couple coats of blue spray paint. After a couple of hours of drying time, I carefully removed the stickers to reveal our reverse stencils. My son loved this step. Finally we used hot glue to glue all of the caps to the picture frame. My husband loves his frame and my son can't wait to use more of his caps to "make art."